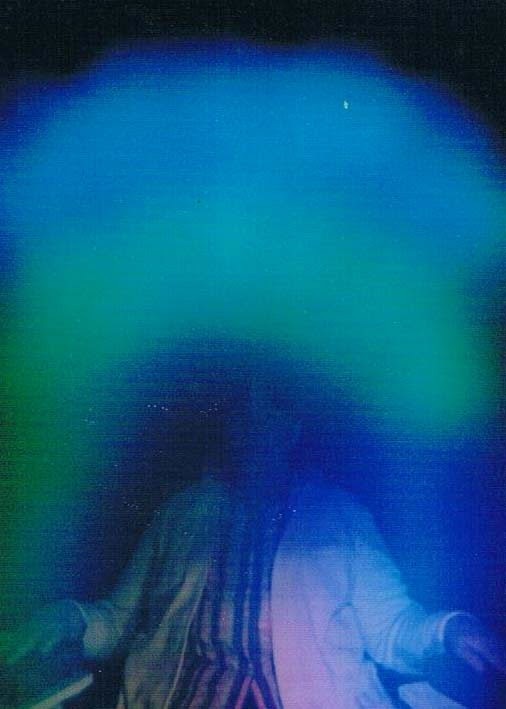 If you have never had an Aura photo taken before I would highly recommend that you do as it gives you a glimpse of what is going on in your soul and that is reflected in your aura. Wikipedia describes an aura thus - "In parapsychology and many forms of spiritual practice, an aura is a field of subtle, luminous radiation surrounding a person or object (like the halo or aureola in religious art). The depiction of such an aura often connotes a person of particular power or holiness. Sometimes, however, it is said that all living things (including humans) and all objects manifest such an aura. Often it is held to be perceptible, whether spontaneously or with practice: such perception is at times linked with the third eye of Indian spirituality. Various writers associate various personality traits with the colors of different layers of the aura. It has also been described as a map of the thoughts and feelings surrounding a person. 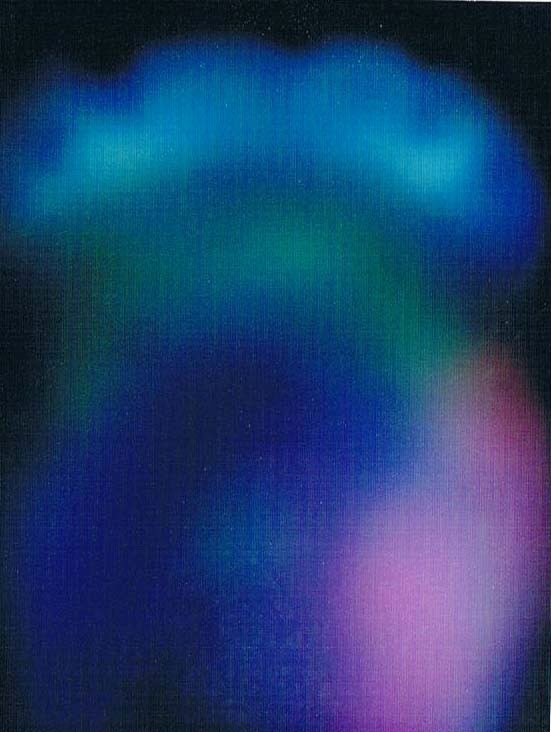 [6"
With each aura photo I have had taken I have been given an explanation of the colours in the aura. I was also told that "The colour above you is what you experience for yourself right now. It is the colour that would best describe you right now. If the colour is high it means aspirations, or what you wish to be. The colour on your left is the vibration coming in to you. The closer it is the sooner it will be felt. And the colour on the right side is what you give out to the world. The vibrational frequency most likely to be felt by others. It is the energy you are putting out o the world". The reasons I am posting these here is to show the transformational power of Divine Love on the soul. This first one was taken on 10th April 2002. This was during a time when we were under a great deal of stress and were uncertain if we would loose everything due to an unfortunate misunderstanding with the bank - its a LONG story that I'm not going to go into here. Notice though that there is quite a bit of dark energy around me in the centre and to the right. Although they did not tell me this then, I now feel that this darker energy is probably due to the influence of darker spirits with me at the time. 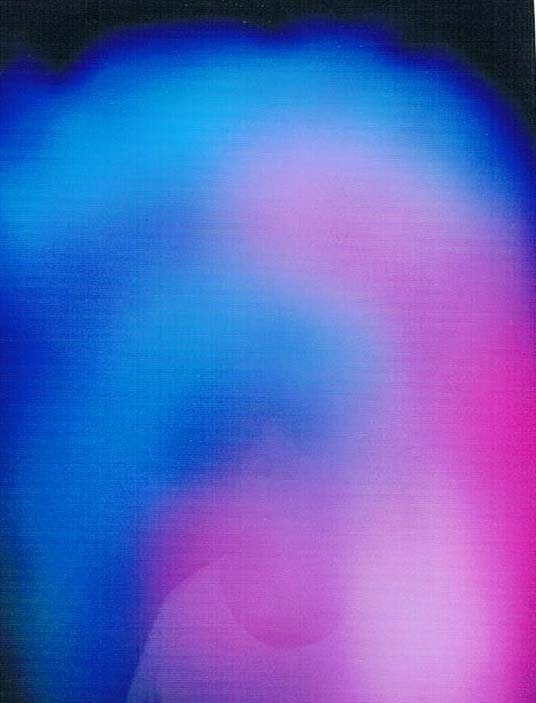 The edges of the aura are somewhat blurred. High above me and to the left side you can see areas of light - the presence of my guides. At this point I was very connected to God - times of great upheaval and uncertainty can do that to you! I feel that I received some Divine Love during this time (although I did not recognize it as such then). Green is the energy of healing, teaching, endurance, balance, perseverance, self-esteem, and self-love. Blue is the colour of communication, unity, depth of feeling, peach, spiritual love and grace. During this phase of my life I was in need of healing - physically, emotionally and spiritually. I also needed a LOT of perseverance, endurance and balance to get through what we were experiencing. I was struggling with self-love and self-esteem. A LOT of communication at all levels was needed. it was the presence of God's Love and my guides that got me through this time of my life. Notice that the colours are somewhat dark and muted in may areas. This next photo was taken on the 16th August 2006. This was another very difficult year for us in lots of ways. It was the year John's younger brother died from pancreatic cancer, another brother was diagnosed with a malignant brain tumour, his mother was very sick at this stage with John and Tim alternately sleeping at the farm with her, three young friends died tragically and we closed the family dairy after over 90years. This next photo was taken on the 27th October 2008. Again there are a lot of holes in my aura leaving me open to spirit attack and I am clearly visible in the photo. The light blue above me shows that I am more connected to God and my guides at this stage but still in need of a lot of healing - still struggling with issues of self-love and self-esteem. Difficult family issues meant that strong communication was needed - particularly in voicing my opinions and standing up for myself. The green around my heart shows that a healing is coming in to this area. The interpretive data describes healing as being important for me right now and the blue indicates a good time to learn. About ten months later I was introduced to AJ Miller and Divine Truth and have been learning ever since! This final photo was taken on 29th January 2014. I have been following the teachings of AJ and practicing Divine Truth (amidst much resistance) for four and a half years. You will notice that the colours in this photo are much clearer, sharper and brighter and the outer boarder is much more well defined. The outer colour is Indigo witch represents universal nature, awareness of truth, clairvoyance, unlimited knowledge, deeply spiritual. There is a LOT more light in this photo indicating the presence of God's Love and of my Guides. There is also a lot more pink in this photo which is the colour of passion, sensitivity, softness, compassion, love and unconditional love. At this point I am opening up more and more to my true soul desires and beginning to ACT upon them. There are much fewer holes in my aura and I am much more protected by my guides and God's Love. The reason I wanted to share these with you is because so many people have doubts about the transformative powers of Divine Love. Most of the people in my immediate circle do not understand the healing benefits of personal responsibility and allowing the full expression of all of our emotions - particularly the difficult, dark emotions. They do not understand when I say that I am working through a particular emotion and wonder what I am on about. Outwardly they do not SEE any difference. My physical condition has not changed much although I can notice subtle changes in my body and in the way I perceive my world and myself. When I shared this latest photo with John and then showed him the previous three - the ones before finding the Way to God - he was confronted. Here was the evidence that he had been looking for. He has watched and supported me on this journey for the past four and a half years not really understanding what I was going through, but at a soul level knowing that things were changing, that I was growing. Our relationship has grown enormously in that time but he could not understand why. He only knew that I often confronted him - so on some level he has grown too. And that is a good thing for us both. 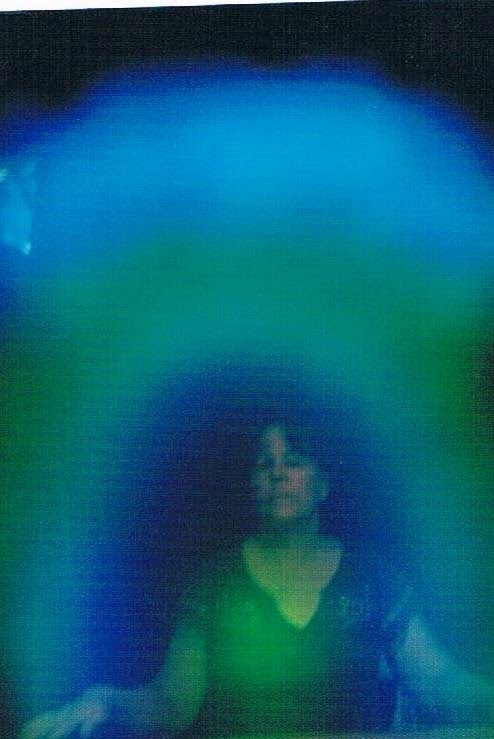 I would like to encourage you all to go and have an aura photo taken and to record if you can the verbal interpretation of the photo - it will show you lots about your soul condition right now. Walking the Way back to God is confronting and challenging and for me often brings up many doubts - Am I growing? Am I deceiving myself? Am I changing at the soul level? Am I doing this right? Having this record shows me that since beginning on the Way back to God I have changed. I have grown and my guides are with me - even if I still have a LOT of blocks to communicating freely with them. They are there. It is up to me to find a way to overcome these blocks and open my soul to clearer communication with God and my guides. I wish you all well on your respective journeys and pray that you may find a way to walk with God as that really is the most transformative and rewarding way to live this life. A friend told me that the white in the photos actually represents FEAR! In the first photo where there is quite a bit of white coming in I was under and enormous amount of fear. Everything in my life was being challenged and I constantly felt fearful. In the last photo where there is a lot more love coming in I knew I was under strong resistance to God's truth. I expected to see a lot more dark areas. But if white is fear then it is clearly evident in this last photo and this feels more accurate. It was several days after this was taken that I was able to work through the fear. I have learnt through this that people on the natural love path do not want to confront truth. Their mission is to gloss over truth and make everything feel better. I understand this. I was just like this for many years. But I have learnt that glossing over truth does not help you grow. It might help you feel better - for a little while - but it will not change the cause of the distress in your soul. And unless we address the CAUSE no real change can occur.